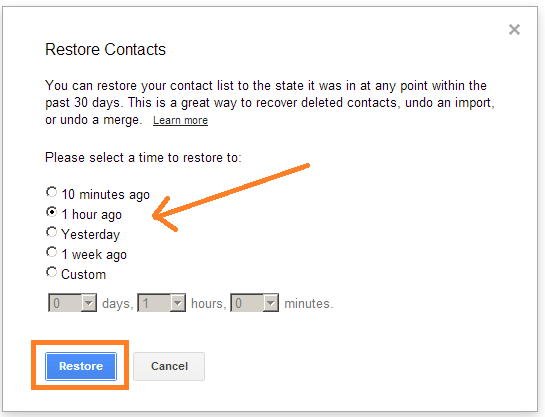 Did you know that you can restore your contacts in your Gmail account even after deleting important contacts? I have done this before, deleted someone’s email address only to find that I did really need it. Luckily you can restore your contacts in your Gmail account, which turned out to be very handy in my case. You can easily revert your contact list and undo any crazy mistakes you have made in an instant. You can restore contacts that you accidentally deleted or lost during syncing to another device. Maybe your Gmail account was hacked and the hacker deleted all of your contacts. 1. Login to your Gmail account. Click on the drop down menu and choose contacts from the list. See the screenshot below. 2. When you are in your Gmail contacts section go to the More menu and press on the drop down arrow. 3. Choose restore contacts from the menu. See the screenshot below. 4. The restore contacts dialogue box will appear. Choose the time you want to restore to. Choose custom to enter a different date to restore to. 5. Click on the restore button below. Your Gmail contacts will not be restored to the same state that they were in at the time you chose. Please note that any contact that did not exist at that time will not be there now. 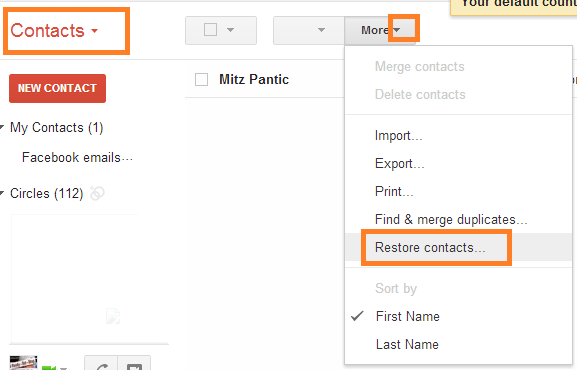 If you have new contacts in your Gmail account then it is better to back them up first before restoring. That way you can add them in later.